Exploring Theodore Roosevelt Island in Washington, D.C.
Theodore Roosevelt Island is a 91-acre wilderness preserve that serves as a memorial to the nation's 26th president, honoring his contributions to the conservation of public lands for forests, national parks, wildlife and bird refuges, and monuments. Theodore Roosevelt Island has 2 1/2 miles of foot trails where you can observe a variety of flora and fauna. A 17-foot bronze statue of Roosevelt stands in the center of the island. There are two fountains and four 21-foot granite tablets inscribed with tenets of Roosevelt’s conservation philosophy. This is a great place to enjoy nature and get away from the busy pace of downtown. Theodore Roosevelt Island is accessible only from the northbound lanes of the George Washington Memorial Parkway. The entrance to the parking lot is located just north of the Roosevelt Bridge. Parking spaces are limited and fill quickly on weekends. By metro, go to the Rosslyn station, walk 2 blocks to Rosslyn Circle and cross the pedestrian bridge to the island. Check out this map for reference. The island is located right along the Mount Vernon Trail and is easily accessible by bike. Bicycles are not permitted on the island but there are racks in the parking lot to lock them up. 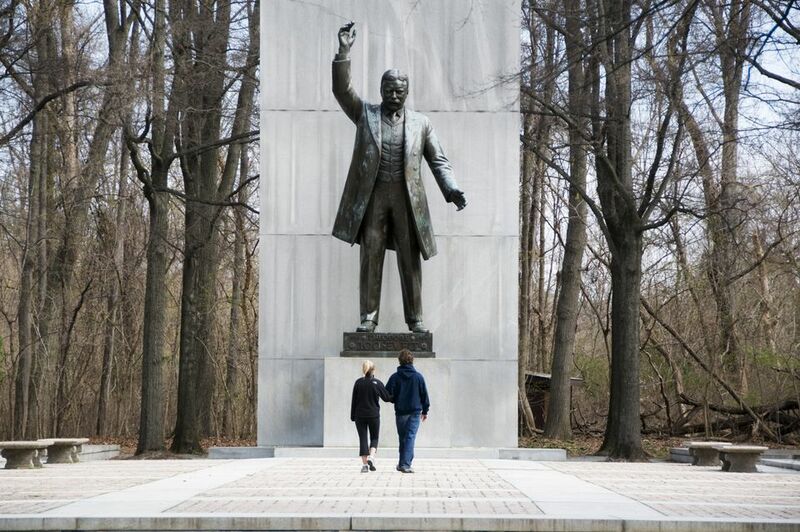 One of the best things to do in Theodore Roosevelt Island is to walk the trails. The island has three trails. The Swamp Trail (1.5 miles) The trail loops around the island through the woods and marshes. The Woods Trail (.33 mile) goes through the Memorial Plaza. The Upland Trail (.75 mile) extends the length of the island. All trails are easy and relatively flat terrain. You can also do some good wildlife viewing. You will likely see birds like woodpeckers, herons, and ducks on the island year-round. Frogs and fish are also easily seen by visitors. Take a stroll to the Memorial Plaza. See the statue of Theodore Roosevelt and honor his life and legacy. Once done, go fishing. Fishing is allowed with a permit. Keep in mind, that on weekends there is a lot of foot traffic and limited space. You should be considerate of other visitors and avoid the busiest times and locations. Theodore Roosevelt Island is open daily dawn to dusk.